Redirecting blogger Url to a custom domain is something that i have been doing for some time now without any hassle. Yesterday's challenge was kinda time consuming considering the fact that i was going to use Godaddy setup for the first time in my blogging career. 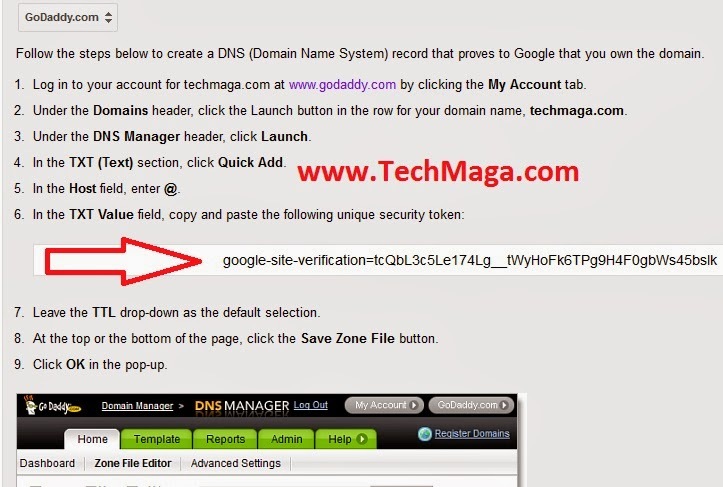 I was like "Is gonna be simple and it won't cost me more than 5 minutes to complete the setup and get techmagaa.blogspot.com redirecting to techmaga.com. 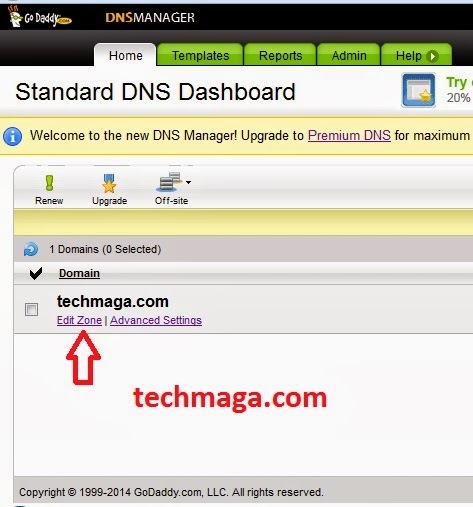 It was time for me to start up the setting and configure my domain Name System settings on my Godaddy dashboard. I logged into the panel and clicked on domains to get my newly purchased name "Techmaga.com" pointing correctly to my newly built blog. After i had completed my setup, i could observe that i was having repeated errors while trying to save the zone. It triggers errors like " You can't save an empty file or so" and i was like "ain't trying to save an empty file." The errors kept on reoccurring and this really got me pissed off. I felt i had wasted a lot of time trying to perform a simple task. After much struggles, i decided to take the bull by the horn and this time, i was going to hit the little challenge harder. I logged into my Godaddy dashboad and restored back my setup to the default settings and began the combat of domain menaces.After much struggles, i realized that i hadn't pointed my domain name to the first label. I actually knew that i had really f**ked up so bad. So i did what i had to do to get it running. I saved my zone and this time, no more errors. Finally Techmaga was pointing correctly, just as i have wanted it to be. Before you kick off with this tutorial, simply log in to your blogger dashboard, go to settings and scroll down to where you have blog address. If you are planning on changing or redirecting your blog url to your newly bought custom domain, simply click on add Custom Domain .A field with an option to fill in your domain name comes up. Take note of where you have the first circle, which is circle A, you will be needing those Name,label or host field and destination, targets or points to" field when you log into your Godaddy dashboard. Did you see where the red arrow is pointing to in the image above? copy those codes and put them in a notepad. Save it somewhere on your system. ==>Leave this page open. Launch another tab on your browser and log into your Godaddy dashboard. Once you have successfully logged in, Under the Domains header, click the launch button for your domain name. You can simply select the option DNS to reveal the next window. That will be a lot more easier. Click on save Zone File and go back to the Google Verification page i asked you to leave open. Click on verify. You should see a message congratulating you for successfully verifying your domain name. Once you have confirmed success in your verification, go back to your blogger dashboard, click on settings and try adding back your domain name. Save it and you are done. Incase you got any problem implementing this tutorial, do not fail to let me know via the comment session below. Your comments are appreciated. keep them coming. 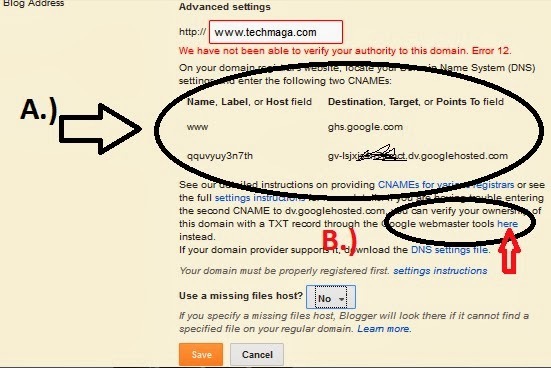 This is such an amazing tutorial I just bought the name " www.naijabing.com " and i have followed your tutorial to redirect it successfully on my own without any ado! Thanks for making life easier with your valuable Information I never knew i could do it so pretty easy on my own Thanks so much BRO,, kEEP ON THE GOOD WORK! Is a great pleasure having you on this blog. I am so delighted you were able to get the problem fixed by following this tutorial step by step. Thanks. I am checking your blog right away to see how it looks.